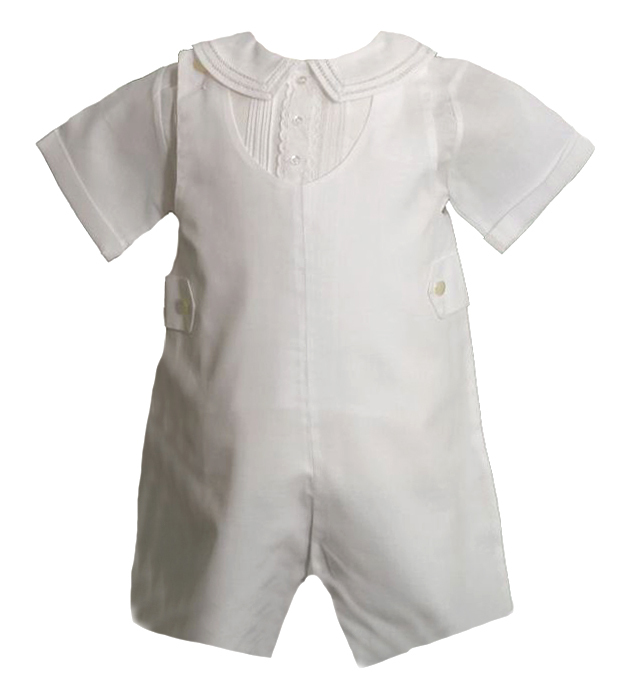 This darling new little boy's shortall by Feltman Brothers features a dressy white cotton blend shirt with tiny pintucks centered by a hand embroidered placket with three tiny buttons. The Peter Pan collar is edged with a double row of fagoting. The shirt is finished with short sleeves and closes in the back with four little white buttons. The white shortall buttons on the shoulders and snap in the crotch for ease in dressing. It has two buttoned tabs at the waist. Note: Similar style is also available in smaller sizes. See below.